Miniature Folded In-Pack Marketing - Flottman Company. Unique, Visual, Tangible and Memorable! Everyone enjoys the prize in their cereal or Cracker Jack box. Imagine bringing the same excitement to your customers by including branded marketing inserts inside your product packaging. Nearly any consumer product can be a candidate for in-pack marketing. These tangible, tactile marketing tools serve as a product and brand reminder. We create coupons, rebates, social media incentive forms, cross-selling opportunities, visual instructions and redemption trackability, all in a well-branded format to expand your marketing strategy. You can reach 100% of the customers that have purchased your product, and advertise to a captive audience that already knows your product and values your brand. Our inserts can be printed in black/white and color. The design can be modified to fit your current packaging, with various folding patterns folding down to 0.5″ and opening to a 13″ x 23″ flat page. 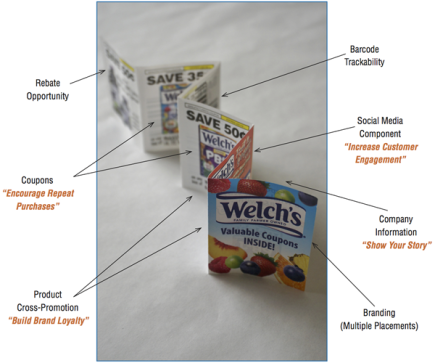 In-pack marketing is a great solution for including instructions, offers or brand marketing. Put our inserts into your packaging and allow In-Pack Marketing to help you build repeat buyers, improve your brand image and create a competitive advantage.